Word Search is an Alfred 2/3 workflow which exposes powerful word searching utilities. Ultimately, the workflow can be leveraged to widen your vocabulary and make you a better writer. syn [word] - Broadly searches for words related to a word/phrase. 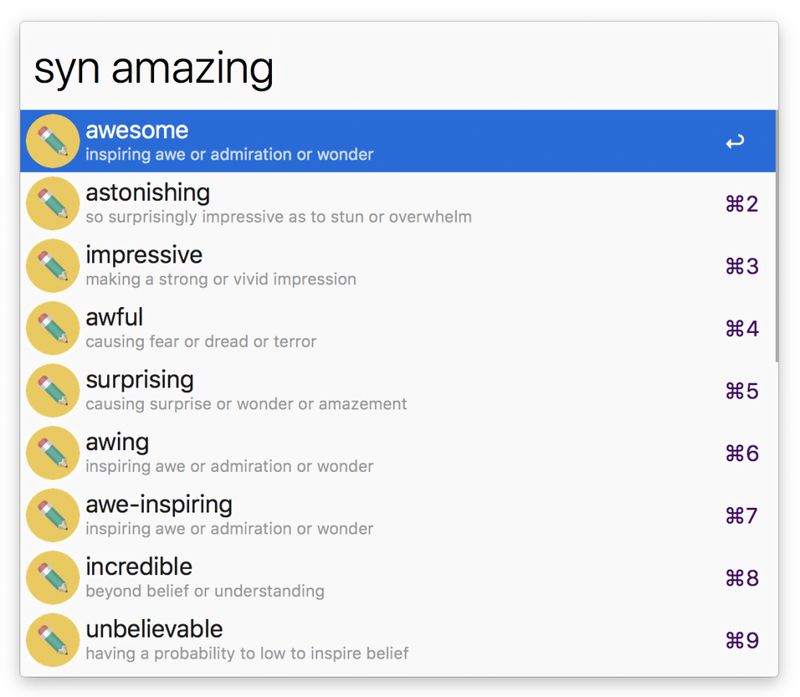 dsyn [word] - Searches for a word’s exact synonyms. ant [word] - Searches for a word’s antonyms. rhyme [word] - Searches a word’s rhymes. Simply type in a command. Selecting a result will copy that word to your clipboard and automatically paste it in the front most app. Simply download the latest .alfredworkflow file and double click it to import it to Alfred. Word Search will update on its own. Alfred Workflow - the framework that wraps this workflow. Datamuse - The dictionary that powers this workflow.